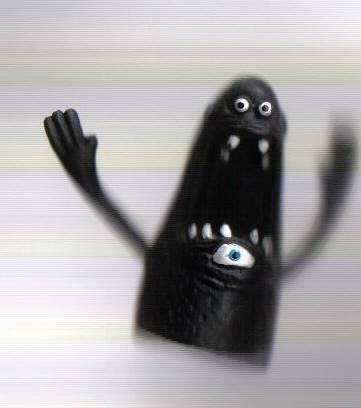 It all began in 1997 with a fingermonster named Roland. Roland was innocently purchased along with his fingermonster brothers, as a fun accoutrement for J's home. At first everything seemed fine but eventually J and her roommates began to notice something strange was going on. Things seemed out of place, alcohol went missing, cell phones moved, keys disappeared, alarm clocks were inexplicably shut off... No one could figure it out. It seemed almost as though someone wanted J to play more and go to work less (although that didn't explain the missing alcohol!). Finally one day, J came home early and stumbled upon the answer. What she found amazed her, and answered a lot of questions. She walked in to find Roland leading all the fingermonsters in an act of sabotage! He was directing all the creatures to disconnect the computer so that J would not be able to work on her dissertation! J understood their intentions were good and tried to communicate with Roland, as he was clearly the ring leader. Eventually they began to understand each other. Roland waves his arms and yells mostly, but he gets his point across (Although it was later discovered through a series of notes, ostensibly from J's roommates requesting more beer, that he can write but is incapable of spelling). A few ground rules were laid down and everyone was getting along swimmingly, until Roland discovered the internet. Well, let me rephrase that. Everything was fine until Roland discovered that using J's credit card he could order more friends FROM the internet. At first J thought she had a secret admirer who had excellent taste in creatures, but that only lasted until that first credit card bill. J tried to handle this firmly but fairly (which FYI, we here at ionlylikemonsters have found to be the most productive approach to managing a houseful of creatures). Roland was given an allowance and was able to purchase more friends with J's input. Even with this limitation, he still spent hours each day looking for creatures online. The whole household agreed this was a positive way to use up his boundless energy, and it did appear to keep him from some of his usual practical jokes and other mischief (He is rather small and hopping from key to key and dancing on the mouse-pad does take up a bit of energy). Roland was told to save his finds and J would go through them with him when she had time. 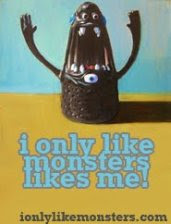 Then one day J realized that Roland had 330 monsters in his Etsy cart alone! At this point J pulled in her roommate Scatterbrian to help her brainstorm, or in this case Brianstorm, about what to do. Scatterbrian, being a computer guy, immediately thought of a blog where all of Roland's wonderful finds could be showcased to other monster loving people. J thought this was a great idea and promptly went about trying to explain this to Roland by showing him her favorite blogs Cute Overload and Must Have Cute. Roland did not understand and screamed and yelled and jumped up and down. J tried again to explain but to no avail. Finally Roland dragged a pencil over to a piece of paper and scrawled out in his terrible writing "ionlylikemonsters" and although he didn't know it at the time, with this sentence, his blog title was born! J and Scatterbrian did finally get Roland to understand that his blog WOULD be about monsters/creatures, that he would be in charge of ALL the content, and that J would write the posts. This settled him down and he began what was clearly meant to be his life's work, (well, when he is not drinking and hiding things) This blog! 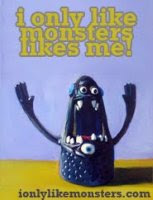 We hope you enjoy it, and we would love to see and post pictures of what the monsters that live in your home are getting up to! Please send them to: us@ionlylikemonsters.com.